We get the health magazine Townsend Letter every month, and find it to be a remarkable resource for all kinds of progressive and alternative health concepts. The May issue had a fascinating article on "Earthing", and I thought I would pass it along. My take is that the essence of earthing is that it drains various kinds of electromagnetic frequencies (EMFs) and static electricity from our bodies. The following article I'm pasting below describes some of the ways in which this can be done, the most simple being walking barefoot, or just having our feet on the ground for up to 30 minutes at a time. I've been doing this regularly for the past few weeks now, and find it to be helpful. I've long had a feeling of having "static" in my body, especially in my brain. Doing this earthing regularly, while simultaneously doing some simple EFT tapping exercises, seems to have grounded my body and brain. I'm just able to relax and feel calmer since I started doing this. At some point, I may take some further steps so as to ground myself while I'm asleep at night. The article below touches on it, but you have to go to a separate website to view various products that are available for purchase. I don't know where that website is right off hand. Interesting. My dad always said if you walked barefoot in the dew on the grass in the morning, it was good for you. Thank you, Wayne! This is so appropriate for me and I feel it is truthful. This summer I've known that I ought to be out at night sleeping in my tent, but I haven't had the energy to get it set up yet. Sleeping on the ground in years past, I could release my jangled energy into the ground and then receive from the earth good, nurturing energy. I felt as though I were in relationship with the Mother then. It was the beginning of knowing how my body, in fact all of me, belongs to Mother Earth. Two months ago I had a hip replacement operation then rehab. Now home, I've been extra tired and my sleep poorer than before. What would be helpful would be if I put my tent up and went out there at 9 or 9:30, instead of staying up to 11 as I always do. Then, when dawn comes, I'd have had the chance to have slept long enough. To add another idea, going swimming in a pond, lake, river or ocean also gives such relief too--not only to the aching body but with that jangled feeling too. Water is a conductor of energy but a great soothing one, as it is the energy of nature or life, to which one belongs. Wayne, thank you! I shall subscribe to the Townsend Letter, and this stuff on EMF fits right in with my interest in both reducing EMF exposure (recently installed Stetzer filters, with major improvement recorded on a Stetzer meter rented for the purpose, and also in the MSR 2000 and Bemer 3000 PEMF mats, which seem able to undo some of the damage done by our insulation from the earth, and our exposure to RF and other damaging forms of electromagnetic energy. But going back to the earth while living in a northern city is a problem! Sing, thanks much for your warm and friendly note this morning. I relate to much of what you mention. I feel I've been somewhat negligent in attending to EMF protection for quite some time now, but feel I'm now ready to make some important strides as I go forward. I recently had a friend visit who brought with him some metal stripping (Company name is Vestu; I think) that was purported to harmonize the electrical energy in the house. I had heard about these types of things, but had a lot of doubt about their efficacy. I had tried similar things at other times with minimal results. But after putting these simple strips on our electrical box (cost about $3), both he, my partner and I felt a very noticeable shift in the energetics of our house. My partner, who is very healthy, mentioned that it felt like a burden had been lifted that she had not even been aware of. I myself feel Ive taken a step up in my ability to function around the house. My friend, an acupuncturist, said it's not easy to find these products, and he himself got his through an acquaintance of his. It's possible it may be a "professional" product only. If you would be interested, I could make it a priority to e-mail my friend, and see whether these really inexpensive strips might be available to the public. Good suggestion on the swimming. I might mention that I believe it's the minerals in the water that conduct electrical energy, and not the water per se. I believe many of us with ME/CFS have mineral and nutritional deficiencies, and one of the effects of this is that it makes it more difficult to maintain bioelectrical harmony in our bodies. Regarding sleep; I have found my sleep to be improved since doing the regular earthing. What a difference better sleep makes! Good luck on setting up your tent and getting started on the program you mention. I know it can't be easy with your lower energy and continuing recovery from your surgery. But if you could get set up, I suspect it could make a very nice difference for you. this stuff on EMF fits right in with my interest in both reducing EMF exposure (recently installed Stetzer filters, with major improvement recorded on a Stetzer meter rented for the purpose, and also in the MSR 2000 and Bemer 3000 PEMF mats, which seem able to undo some of the damage done by our insulation from the earth, and our exposure to RF and other damaging forms of electromagnetic energy. Chris, I've not heard about the Stetzer filters, but will do a search on it to learn more. I've been interested in the Bemer 3000 since Michelle posted on some positive experiences in recent months. I really think EMF protection could be an important component for many of us. I myself plan to pursue this looking at a variety of things. The product that intrigues me the most at this time is sheets which apparently can ground you while you're sleeping. I think I remember them being about $75 or so. http://www.drgauss.com ; there are others. There is also an expensive book by Joel P. Carmichael on the MRS 2000--he is deeply involved in the product--this is not an impartial book. It does contain some good information, but much less than its price and 350 pages promise. My overall impression, after doing some reading of the research on these PEMF machines, is that they do do some good, as Michelle testified, and have particular usefulness in some conditions such as osteoporosis and bone fracture, but have come to the conclusion that with limited funds I will get more from reducing my exposure to damaging EMF than by getting periodic small boosts from these mats. There are also some specific warnings (I appreciate the honesty that produced these): don't use these machines during pregnancy or on the very young, if you have electronic implants, or serious cardiac arrhythmias, while taking oral steroids, or in the presence of metastatic disease--this last is a bit tricky, since I guess that can begin without any obvious signalling. So I rented a Stetzer meter, which measures the high frequency pollution stuff that gets into the basic 60 cycle power lines in a building by various routes; I found very high readings in the order of 300-400, and installing (expensive, but compared with a PEMF mat cheap) Stetzer filters reduced those readings to around 70--still higher than I would like (recommended--20! ), but much lower, and I do seem to feel a bit better as a result (though am also taking Stem-Kine, and would say the same of that--I never know just what is doing what... ). I live in an apartment building with a forest of cell phone and other devices sticking up from the roof and am looking for an apartment in an electronically quieter part of town! Rich van Konynenburg has a post somewhere on this forum (!) suggesting a path by which EMF could be particularly damaging to us--wish I could remember just what he said! As usual, our governments have abandoned the field to private enterprise, which insists that all this stuff is good for us, or at the worst not really bad. away to keep electrical devices etc. Last year after many years of thinking about it I bought a Trifield Meter (model 100XE). The meter was a revelation. I found that it is very hard to do a really thorough job of reducing emfs without use of a meter. may uncover some emfs that are hard or expensive to reduce. So if it's the thought or belief that I'm reducing emf danger by using an emf pendant or some such "magical" device that helps you feel better, well you may not get that from a meter. You can reduce exposures a lot but you may (and I certainly did), find a lot of emfs that you were not expecting, and are hard to avoid. And oh yeah, despite greatly reducing my exposures I have noticed no health changes. Still, I'm glad I'm reducing this stuff. Let's hope the grounding idea is for real. YES!!!! I love to take my shoes off and walk along the beach.... I NEED to do this. I always feel better....somehow, certainly in attitude.....in being..... I love the ocean. But I NEED to get my feet in the sand...... Must get back to your thread at some time, need to sign off now. You may be referring to the post in which I suggested the hypothesis that EM sensitivity in PWCs may be a result of inability to properly maintain the myelin "insulation" on nerve fibers. There are at least three components of myelin that require methylation for their synthesis in the body--phosphatidylcholine, choline plasmalogen and myelin basic protein. We now have good lab-based evidence that there is a partial methylation cycle block in nearly all PWCs who have had the methylation pathways panel run by Health Diagnostics and Research Institute (formerly Vitamin Diagnostics, Inc.). We should expect that if there is a problem with methylation, the integrity of the myelin will suffer. In addition, the best-documented brain-related feature of CFS is slow processing speed. Myelin is normally responsible for the abiliity to transfer nerve impulses down the nerve fibers at high speeds, because of its high electrical resistivity and its low inherent capacitance (note that it is composed primarily of lipids, which do not conduct electricity and do not have a dipole moment, which would raise the capacitance). I suggest that without robust myelin insulation, the nerve fibers are vulnerable to having currents induced in them by external electromagnetic fields. The body, being a conductor because of its high water content, with dissolved ions, acts as an antenna, receiving electromagnetic signals from the environment. These induced currents can be expected to influence the nervous system in a deleterious way. This hypothesis seems to fit the available observations and the accepted anatomy, physiology and biochemistry pretty well, as well as being consistent with known electromagnetic theory. What can be done about this? Well, living inside a Faraday cage would be a short-term measure, and grounding will probably help, also, but in the longer term, the partial block in the methylation cycle needs to be lifted, so that the myelin can be repaired, and thus the normal protection of the nerve fibers can be restored. That is the goal of the methylation cycle treatment that I have suggested and that is being increasingly used by PWCs. For more information, see www.cfsresearch.org and click on CFS/M.E. and then on my name. I have been out very little lately so yesterday ...said to hubby, "let's go for a ride." Our town beach is small by most of our State's standards, but it is nice, has a grassy area with benches, then the sand, then the ocean. So we sit on the bench. "Let's take our shoes off and walk along the beach" I said. "Oh come on," I coaxed. "everyone should get their bare feet connected to the ground sometimes." He snickered......"Not me: he replies, "I am a pilot, my feet should not touch the ground." Side note, he was a military pilot, but has not flown for years. When I first saw this post I sort of thought it was obvious and a tad "out there". Then I realized that there really IS something to this. When I was a kid and teenager, I and my siblings never wore shoes all summer long. Before school started, my father had to take a razor and cut down the heavy callous on our heals since they had built up so thickly and our shoes would not fit with all that thick heal. As kids, we simply could not and would not wear shoes outside even on the rocks, hot pavement, glass strewn grass, etc. Of course we all became adults and put our shoes back on and kept them on since that's what adults do. Well, after reading this post I did start back to not wearing shoes outside. There really is something about having your feet and skin touching the ground. Something primal and lovely. Of course, where I live I do have to watch out for Rattlers and Copperhead snakes but then, where I grew up we also had TONS of Rattlers and they never bothered us even when we played and laid on top of the rock outcroppings that Rattlers love to live in. I do think there is something to this. What, I don't know but it sure feels nice to get those shoes off and be a kid again. Thanks for this post! Yes, muffin! I too went without shoes all summer. I climbed trees, learned to ride horses, loved to swim and run through the fields. This wasn't "jogging" for exercise but an expression of happiness. I loved all animals and never got bitten by anything other than bugs. When I was ten, I had to start wearing a shirt, which felt ominously like the beginning of confinement, which it was, in the culturally prescribed female role in this case. I belonged to nature-- that is how I felt. I chuckled to read your thought that this thread is a little far out, because actually, how we live now with all our electronics, machinery and buildings is what is far out. How we are encased in a context of EMFs and other energies that we were never designed for. We are creatures of the earth essentially, still, and it feels good to remember this with our feet and our hearing--the birds, the wind in the trees, the ocean--and our skin. It isn't only the sight of nature, pretty pictures which we need, but visceral contact. I feel like a thirsty person who can finally drink, when I go outside. It relaxes and restores me, and it lifts my mood. And then I go back to the computer! What will the children of today think is natural? We are moving away...through technology...from nature...without giving it much thought, other than the usual statements "well, back in my day I walked five miles to school.....yady, yad, kids these days sit in front of the tv too much, yady, yady." Hi, all; have not revisited this thread for quite a while, so this is catch up. Thanks, Rich, for the reminder--at least my memory had not totally betrayed me! Makes sense to me, and I still do the simplified meth protocol, more or less, most of the time. I think it helped me, but seemed to plateau out. I have now read "Earthing," and checked out the www.earthinginstitute.net website; I am in the throes of moving to a new apt, not topped by cell phone relay towers, and will buy a ground checking device at the hardware store, and depending on what that tells me about the electrical ground in the building, plan to buy one of those grounding sheets--I can't run a wire to ground in an apt building, unfortunately. My impression after reading the book is that this stuff may do most of what is claimed for the Bemer and MRS 2000 PEMF machines, which after all make as one of their central claims that they closely imitate the electromagnetic field of the earth. My impression is that they do some good, but maybe "Earthing" is a much cheaper and more direct route towards the same goal. At least I hope so! Your report of having "plateaued out" on the simplified methyation protocol corresponds to what I've heard from quite a few others. It seems to help about two-thirds significantly, a small number have reported complete recovery, and about one-third report either that they couldn't tolerate it, or that they didn't experience anything from it. So there is definitely more to learn, and perhaps the retroviruses will be the missing factor. The methylation treatment seems to be an important component of the treatment, but it doesn't appear to do the whole job for most PWCs. Some people are now saying that if they take care of other aspects first, then the methylation treatment is the last thing they need to do to recover. I'm trying to figure out what all those other things are. It's true that the neutral line from the power company is attached to the earth, and the national electrical code requires that both the water pipes in a house and the neutral wire of the electrical system be grounded to the earth. This is done as a safety measure, especially important during lightning storms, to prevent electrocutions. Generally speaking, though, not much current flows from the neutral line to ground. The power companies don't actually use it as a return line, as far as I know. There would be too much resistive loss of power if they did that, so it wouldn't be economical. I don't know about the farmers reporting decreased milk production, but since the earth is so large and has such a large capacitance from an electronic point of view, I think that grounding one's body to the earth would give a pretty steady potential, and would drain off currents induced by atmospheric electromagnetic radiation. I’m told that Russian scientists used Bentonite clay to protect their bodies from radiation when working with nuclear materials. What I heard is ingenious. They would first coat their hands and bodies with hydrated Bentonite mush mixture before donning radiation suits, and presumably the clay would help trap and stray radiation particles. Afterwards they would just wash it off. I ran across the above paragraph a short while ago, and was quite intrigued by it. I've been really interested (and concerned) about doing what I can to protect myself from all sorts of radiation, EMFs, microwave frequencies, radio frequencies, satellite/cell phone frequencies, etc. I've used clay in the past for various reasons, primarily to do clay foot baths. But I've also applied it topically on occasional rashes I get, and found it to be quite helpful. When I saw the above paragraph, I decided to apply some "hydrated clay solution" over my entire body. I've just begun to do this, but so far, it feels really good. I don't know exactly why this would be, or what it might all be doing (it might even be some kind of "earthing" aspect), but I plan to continue this for a while, and see if it feels right to make this part of my regular regimen. Take 1/2 cup of clay powder, put it in a Vita Mix or blender, and blend at high speed until it begins to thicken (about 30 seconds or so). Obviously, you can make many quarts of clay solution from a single pound of bentonite powder. Suggested Use: As a dietary supplement, take 1/4-1/2 level teaspoon twice daily with juice or water. For best results, consume with plenty of fluids and bulk-forming fibers. 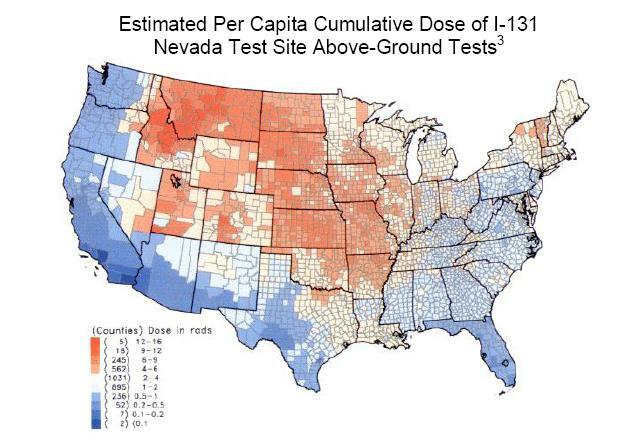 Here's an interesting nuclear fallout map. It sure seems most of us likely have at least some level of radiation stored in our bodies. I also had a fairly large number of x-rays taken in my lifetime, especially as a young child (back when they gave off far more radiation). Seems the prudent thing for me to do is get started on some kind of clay ingestion program to see if I can reduce some of my radiation levels. Who knows, maybe it will help some of my ME/CFS symptoms. I note a cfs doctor called Blake graham advocates it.